Free Diving is a poignant tribute to the Indigenous men and women who worked in the pearling industry as ‘free divers’ in the late nineteenth century in Western Australia. In a practice known as ‘blackbirding’ (forced unpaid labour), European pearl lugger owners used Indigenous people to dive for pearl shell. With no protective suits, the divers faced threats such as decompression sickness (known as the ‘bends’), shark attack, or of being swept away by huge tides. At sea for weeks at a time, there was also the risk of the luggers being shipwrecked in cyclones that formed off the coast. 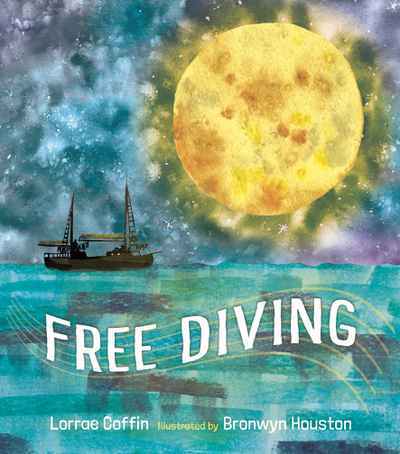 The lyrical narrative is based on the celebrated song ‘Free Diving’ by singer–songwriter Lorrae Coffin. It sensitively reflects the emotional journey of a young man who leaves family and country to work on a lugger with Japanese and Malay divers by his side. Bronwyn Houston’s illustrations are a deep-sea celebration that illuminate both the glory of the ocean and the extreme dangers encountered by the free divers. Free Diving is a fictionalised story of a young man lost at sea. Watch the video below to learn more about Free Diving.